The world is getting warmer – and US scientists now know precisely how much warmer. They calculated the radiation from the sun, the heat reflected back into space, and the rising temperature of the seas and say the extra warmth is equivalent to a 1 watt lightbulb shining constantly over an area of 1 sq metre everywhere on the planet. That would raise average temperatures by 0.6C before the end of the century, they report in Science today. Warming at that level, maintained over 10,000 years, would melt enough ice to raise sea levels by a kilometre. 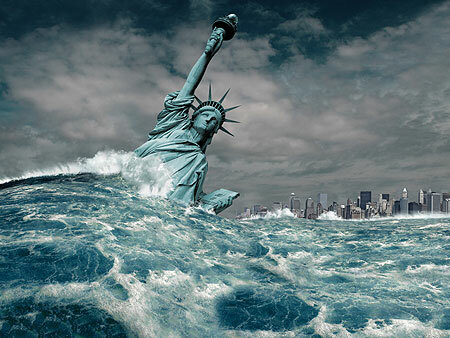 Ninety percent of the US will be underwater, like Manhattan’s West Side Highway has been since 2008. Time to buy your Boulder, CO beachfront property before it’s too late!! Did you see the correction, taken from the Grauniad’s “Corrections and clarifications column”? Of course, if there were that much ice, we would be talking about an entirely different planet, and there would probably be no life on it. More likely, this is all being caused by something that is not quite as bright. Warming at that level, maintained for 10,000 years means 600 degree higher temperatures. In that case the sea level will drop very far while everything above it gets steam cooked. So, wait, I thought we were supposed to get 3°C or more by the end of the century. When did they decide that 0.6°C was correct? & when did they say why the lower number was correct? These numbers are like the climate; they run in cycles. Exactly – even if this is true its warming much less than what they predicted.